The biggest Bundesliga game of the season so far as the top 2 face off at the Allianz Arena as Bayern Munich seek to overtake Dortmund for 1st place this weekend! The situation is clear, both teams need to get a result here. Dortmund currently are the league leaders with 63 pts, 2 pts above 2nd placed Bayern so if Dortmund were to win it’d be a HUGE step towards the title, but if Bayern win they’d go above their rivals. A lot is at stake in this meeting. Looking at form, both teams seem to be playing well right now. Bayern have picked up 19 from their last 21 available points in the league (6W 1D) and although they drew their last game against Freiburg, it shouldn’t diminish the fact that Bayern are playing some great football overall at the moment in the league. 5 shots on goal - 5 goals and only 28% of possession. Final result 5-0. That's incredible. 5-0 😄 , yeah this is Bayern's league again. 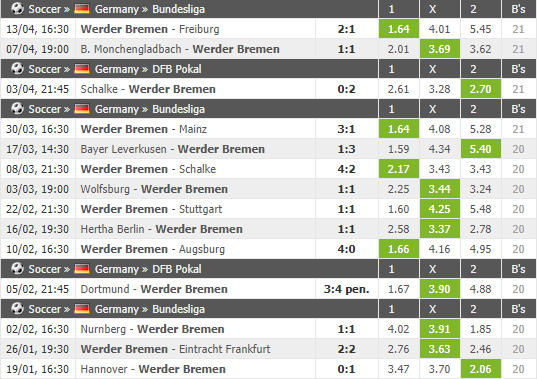 Class performance so far in 2019 from Werder Bremen. Does anyone understand what is happening to Schalke?